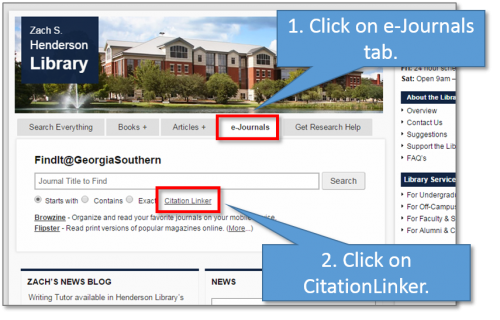 The Henderson Library is excited to announce the addition of CitationLinker to our e-journal lookup tool, FindIt @ Georgia Southern. CitationLinker is available from the e-Journals tab on the library homepage. CitationLinker is an advanced search tool for finding full-text coverage of journals and articles via FindIt @ Georgia Southern. CitationLinker allows you to search by journal title, volume and issue number, issue date, ISSN, article title, DOI, PMID, start and end pages, and author name. While it is not a replacement for Discover or our other databases for finding most known citations, CitationLinker can be useful for quick searches for full text by ISSN, DOI, and PMID. For additional information about CitationLinker and how to use it, please see this FAQ post.